Carex Fun Edition Unicorn Magic Shower & Bath is good but not great. The fragrance is best described as a sugared violet sweets fragrance. It’s enjoyable but very fleeting. The formula is nice. I wouldn’t say the shower gel is hydrating, but it certainly doesn’t make my skin feel dry. Like I said, this shower gel is good but not great. Imperial Leather Cosmic Unicorn Fantasy Icon Bath Soak was a nice surprise! From the bottle it smells terribly bland, and I thought this one might end up in the hand wash dispenser. However, I’m glad I gave this product a try because once it hits the skin, it smells pleasantly floral and soapy. Whilst the fragrance isn’t very special, I do like it. I’m also happy to report that this product doesn’t make my skin feel dry. Whilst I ended up liking both products, I think Carex‘s Unicorn Magic is the better product. The cute fragrance fits the cute unicorn theme perfectly. 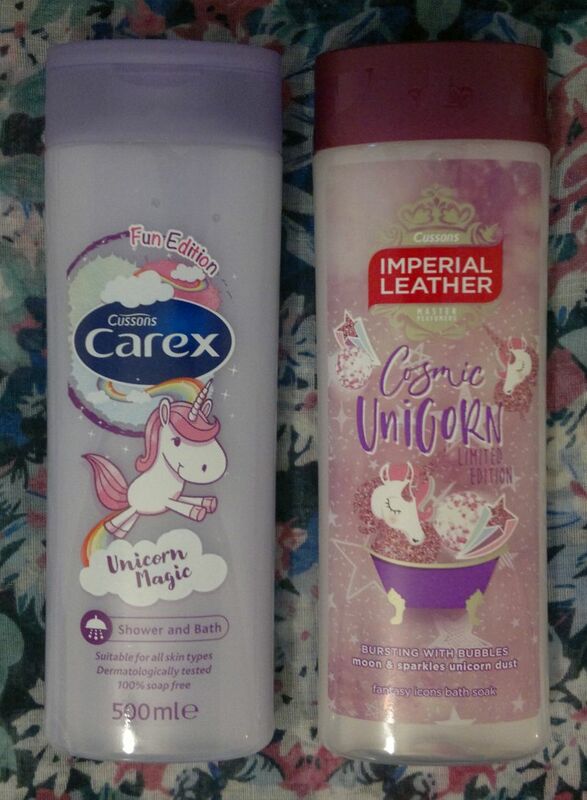 Carex Fun Edition Unicorn Magic is available as Hand Wash and Shower & Bath.I paid £1 for the 500ml Shower & Bath. Imperial Leather Cosmic Unicorn Fantasy Icon Bath Soak is available as Shower Gel and Bath Soak. I paid £1 for the 500ml Bath Soak. 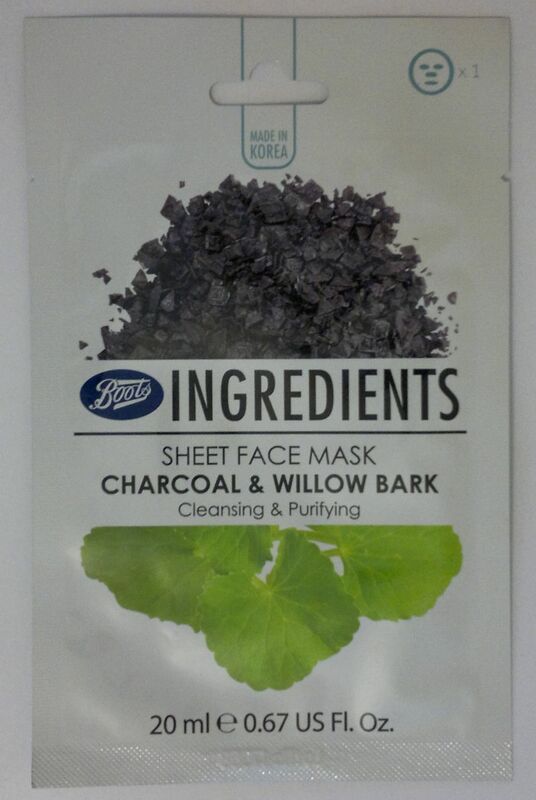 Boots Ingredients Sheet Masks – Which One Is Best? 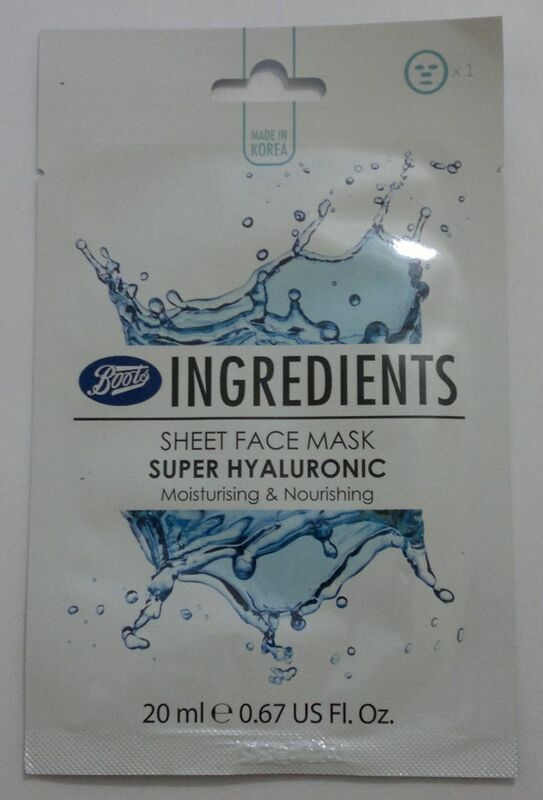 Let’s start with my least favourite Ingredients mask! I was expecting Boots’ Super Hyaluronic to provide proper hydration. However, the mask left me disappointed because it didn’t hydrate my skin at all. I wouldn’t say it was dehydrating, but it wasn’t really that far off. I gave this mask a second chance, but I had the same experience. I wouldn’t recommend this mask, and I wouldn’t buy it again. 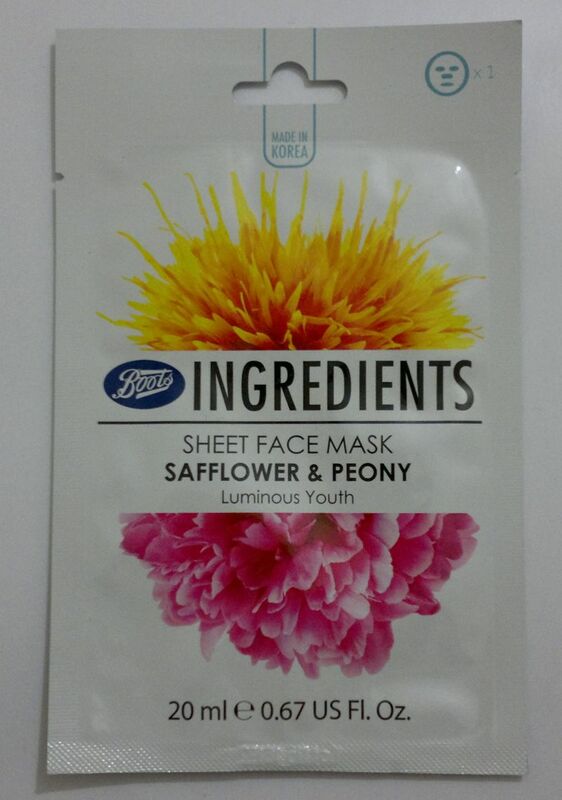 This is another Ingredients mask that I wouldn’t recommend or buy it again. Whilst this mask didn’t dehydrate my skin, it just didn’t do anything. It didn’t brighten my skin, it didn’t make my skin look more radiant, it didn’t make my skin look or feel different at all. If I hadn’t used this mask, I wouldn’t have missed it. Now we’re moving on to the better Ingredients face masks! 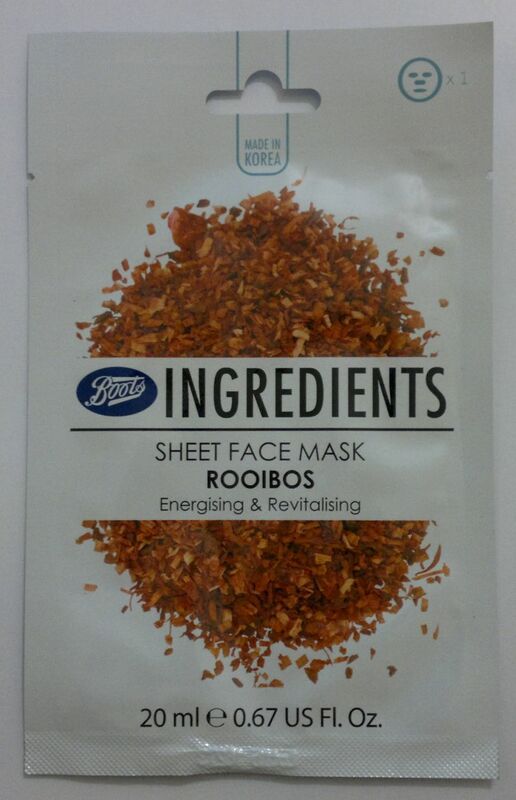 I really enjoyed the Rooibos mask because it made my skin look and feel energised and refreshed. This is a great face mask! Well done, Boots! 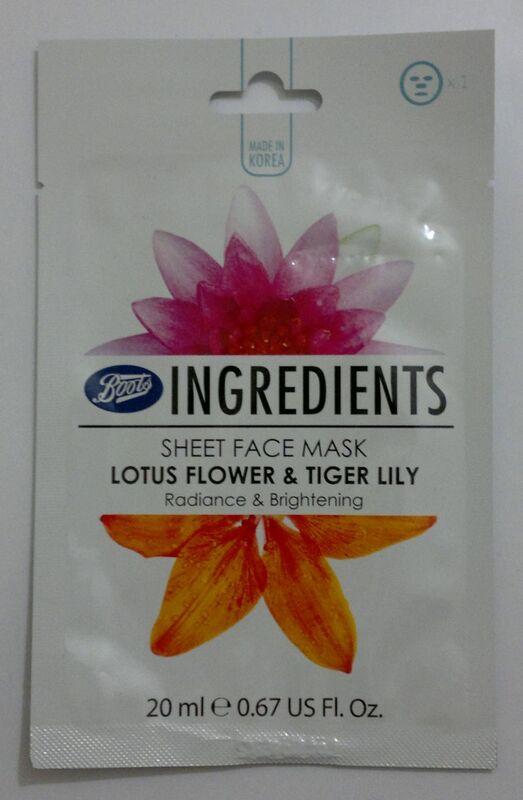 This is another great Ingredients mask. I’d rate it slighter higher than the Rooibos mask because this one delivered on its younger looking skin promise! Thank you, Boots! And here’s my favourite! This mask has impressive skin cleansing and purifying powers. My skin looked and felt clearer and cleaner, my pores appeared smaller, my skin tone appeared to be more even, and my skin felt calmer overall. This mask is one of the best masks I’ve ever tried, and I would recommend it to everyone with (or without) problem skin. Have you tried any of the Ingredients masks? Or would you like to try them? Feel free to comment. And thanks for stopping by! Let’s start with Nails Inc.’s Caviar Base Coat! This product claims to be nourishing, smoothing and anti-staining. But it does the exact opposite! First of all, this base coat made my nails feel brittle. As soon as the base coat had dried, my nails felt like they lost their natural flexibility. Scary! I also didn’t find this base coat to be smoothing. I had to apply 2 layers of base coat but that didn’t help. Actually, applying 2 layers of this base coat was the worst thing I could do because the base coat has a strong red tint which didn’t go well with the colour polish I applied on top of it. I picked up Poundland’s Makeup Gallery Well Polished Nail Hardener for 50p (closing down sale). I didn’t know if it was any good, and I had no expectations. 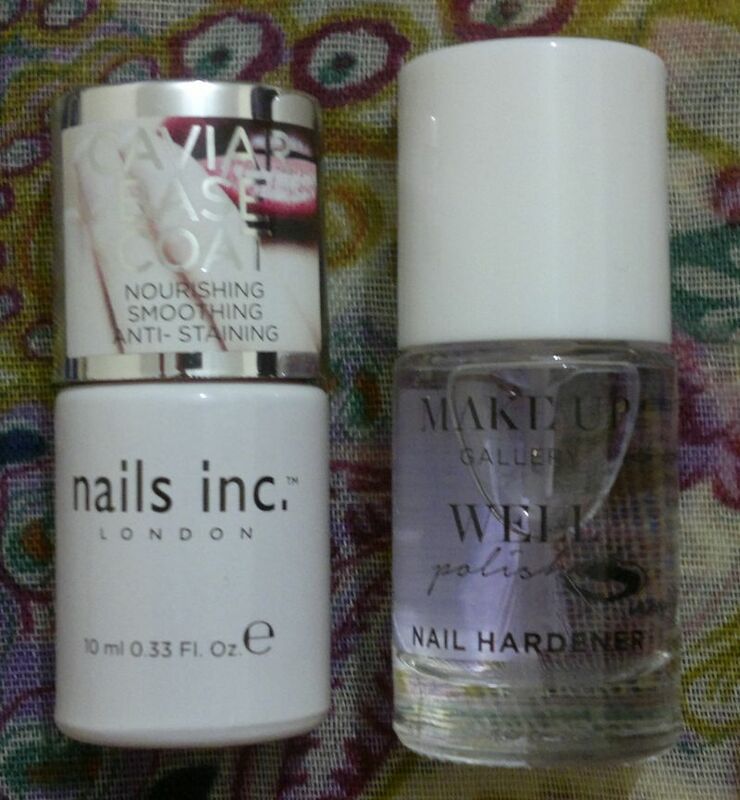 So I was happy when it turned out that this nail hardener makes quite a difference to my nails. It doesn’t have any lasting effect, so when I take off my mani, my nails are super soft again. But I’m glad this product doesn’t make unrealistic promises. And I really like how strong my nails feel when I’m wearing this nail hardener instead of a base coat or a regular clear polish. Well, the winner of this comparison is – obviously – Poundland’s Makeup Gallery Well Polished Nail Hardener! Try it yourself, I’m sure you won’t be disappointed! Hi there! I haven’t done any product comparisons in a long time. However, I’ve had two untried strawberry-scented body mists in my stash for ages, so I thought it’s time for The Battle Of The 100% Cuelty-Free + Made In The UK Strawberry-Scented Body Mists! 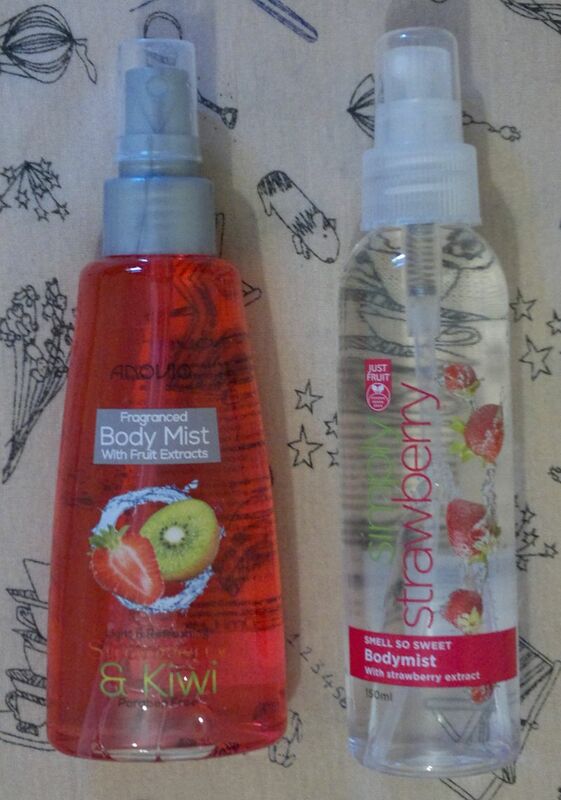 Now meet Anovia’s Light & Refreshing Strawberry & Kiwi Body Mist and MPM’s Just Fruit Simply Strawberry Body Mist. Let’s start with Anovia’s Strawberry & Kiwi Body Mist! This body mist promises light moisturisation and delicately fragranced skin. Whilst I’m not sure whether this product really moisturises my skin, I think the fragrance is actually quite nice. Thanks to the kiwi note, this body mist is considerably fresher than your average strawberry-scented body mist. Well done, Anovia! Oh, and Anovia’s products are made in the UK, and they’re cruelty-free! Now let’s take a closer look at MDM’s Just Fruit Simply Strawberry Body Mist! This body mist promises to leave skin smelling delicately fruity – and that’s exactly what it does! I think this strawberry fragrance is also one of the most pleasant ones I’ve ever smelled. I have to admit that I don’t like strawberry-scented products in general. That’s because most of them smell like strawberries that are about to go off. However, this Just Fruit body mist, which was made in England and is cruelty-free, doesn’t have that obnoxious overly ripe stench that almost all the other strawberry-scented products out there have. Well done, MPM! Now let’s get to the actual comparison! I think that both body mists are really nice. Anovia’s body mist is fresher, so it’s more suitable for the warmer seasons. However, the Just Fruit body mist is sweeter and, obviously, it’s all about strawberries. Both body mists are available in 150ml bottles. The Anovia body mist is £1 at Poundland, the Just Fruit body mist is 79p at Home Bargains. I don’t think The Battle Of The 100% Cuelty-Free + Made In The UK Strawberry-Scented Body Mists has a winner. I would definitely recommend both products. If you want a strawberry-scented body spray that smells fresh and authentic, forget about Boots or TBS. Just try these body mists! Hi there! It’s been a while since the last ‘which one is better’ post. However, I just realised that I bought these two body lotions with aloe vera very recently, so I thought I’d look into which one is better. 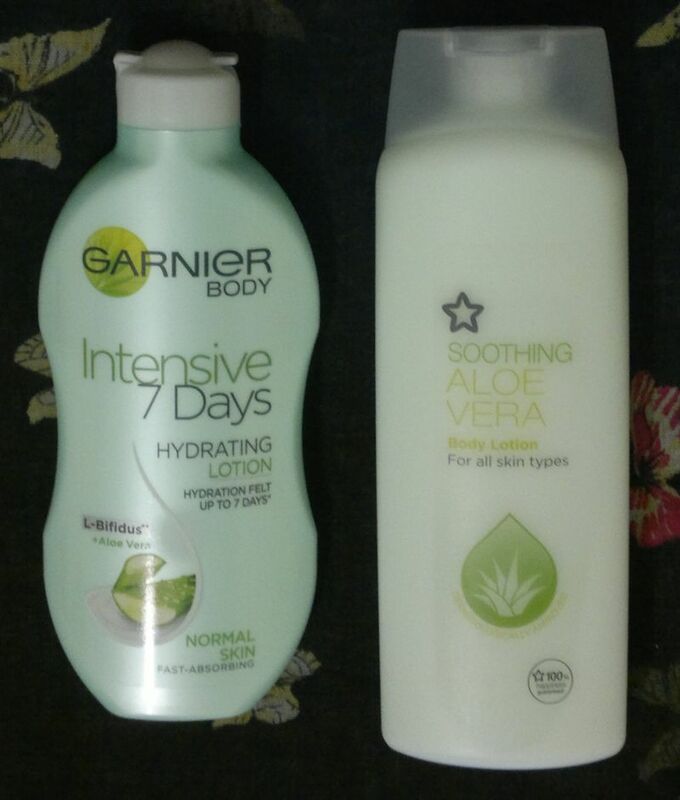 Garnier’s Aloe Vera Body Lotion for normal skin is a very good moisturiser. It smells subtle, fresh and green. The lotion is fast-absorbing and non-sticky. It makes my skin feel elastic and nicely hydrated. After using this body lotion once a day for three days my skin felt like silk. I could even get away with not using any body moisturiser at all for the next two days – and my skin still felt and looked great. This body lotion is for normal skin but it made such a difference to my dry and sensitive skin. I’ll definitely buy it again! 10 stars! Superdrug’s Aloe Vera Body Lotion is a moisturiser for all skin types. It smells absolutely gorgeous. The lotion is fast-absorbing and non-sticky – just like Garnier’s body lotion. However, Superdrug’s body lotion is rather light which, I think, makes it more suitable for summer than for winter. My skin feels nicely hydrated when I use this body lotion every day. But I really have to use it every day to maintain this effect. In my opinion, Superdrug’s body lotion is decent. But it wouldn’t be my first choice to ‘treat’ dry and sensitive skin in winter. Verdict: Garnier’s body lotion doesn’t smell as nice as Superdrug’s, and Superdrug’s body lotion gets extra points for being BUAV-approved and cruelty-free (it carries the Leaping Bunny logo). However, because of its skin transforming powers (!) Garnier is the clear winner of The Battle Of The Aloe Vera Body Lotions. Garnier’s Aloe Vera body lotion is available as 250ml for about £3 to £3.65 and 400ml for £5 to £5.50 – depending on where you shop. I got my 250ml bottle for £1.49 which is definitely good value. If you look for a bargain, the 250 ml bottle is currently £1.50 at Wilko’s. Superdrug’s Aloe Vera body lotion is available as 375ml for £1.49. 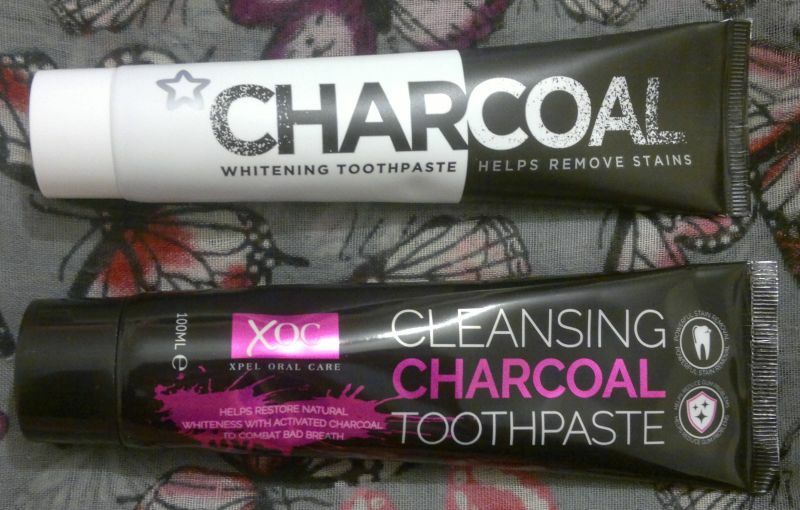 I spent 99p for this product and there is usually some kind of deal (usually 1/3 off) at Superdrug. Hi there! After the battle of the limes and the battle of the lemons, the Battle of the Melons is now on! 🙂 I bought this Grace Cole Fruit Works Watermelon & Pink Grapefruit shower gel ages ago, but I left it untouched until I realised that I also had this melon-scented Superdrug Kids Head To Toe Wash. So I thought it’s time for another product comparison! Grace Cole Fruit Works Watermelon & Pink Grapefruit smells pretty much of watermelon only. I think the scent is not unpleasant, but it’s very generic and forgettable. In my opinion this shower gel is quite expensive (£4) for what it is. I paid 99p only, so I won’t complain. However, I wouldn’t buy it again. Saying this, scents are personal, so the next person might love it. Superdrug Kids Head To Toe Wash is not perfect either. The shower gel is quite thin, so it spills out of the tube the moment you open it. As this product is aimed at kids, I think it would be better if Superdrug changed the packaging (but keep the elephant and the mouse, please) to a bottle with a lid on top to prevent unintended spilling. In regards to the actual shower gel, it’s very gentle and soft which is great if you have dry or sensitive skin. The sunny honeydew melon scent is very authentic – well done, Superdrug! 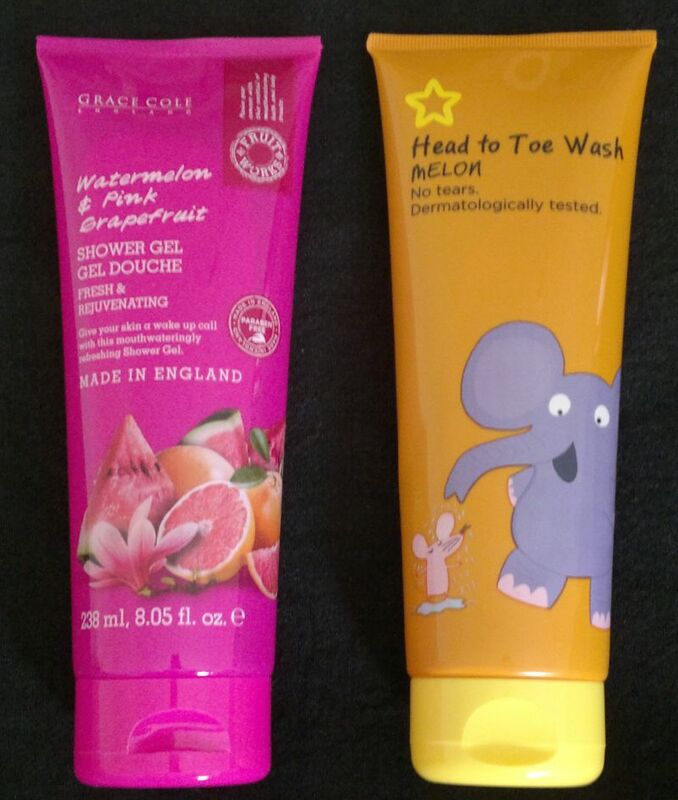 In my opinion Superdrug Kids Head To Toe Wash is the winner of the Battle of the Melons. It feels nicer on the skin (well, it’s for kids after all), the fragrance is more intense and, priced at £1.29 it’s a bargain in comparison to the Grace Cole shower gel. In addition, the Superdrug shower gel is BUAV-approved and carries the Leaping Bunny logo – it’s suitable for vegans and it’s cruelty-free.